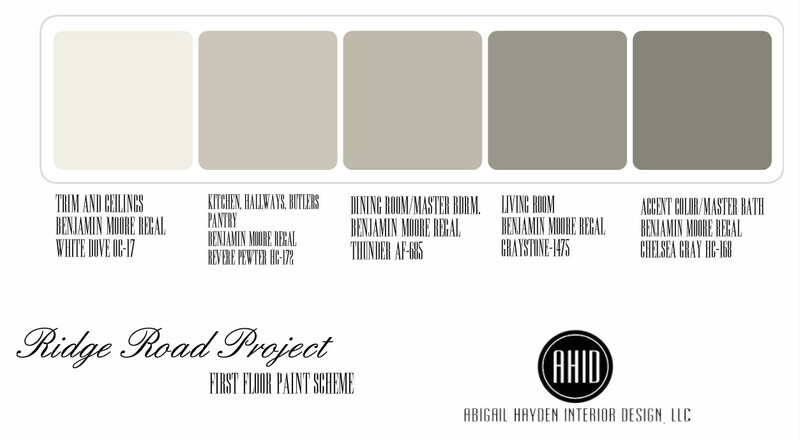 One of the services AHID offers is to provide clients with a paint scheme for their entire home. 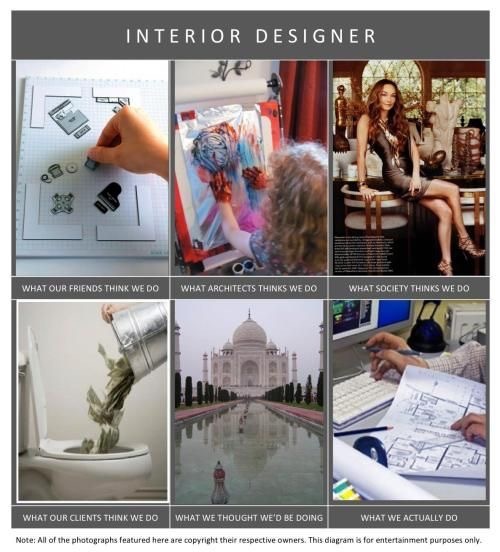 I love this service because I can do it with my local clients or I can provide it to my E-Design Clients. Whether you are building a new home, remodeling an existing home or have decided to repaint and just not sure where to start, I can help! This service is $200 and I will provide you with custom boards for your home as well as oversized paint samples from my preferred vendor, Benjamin Moore. Lots of Kids spaces lately!! 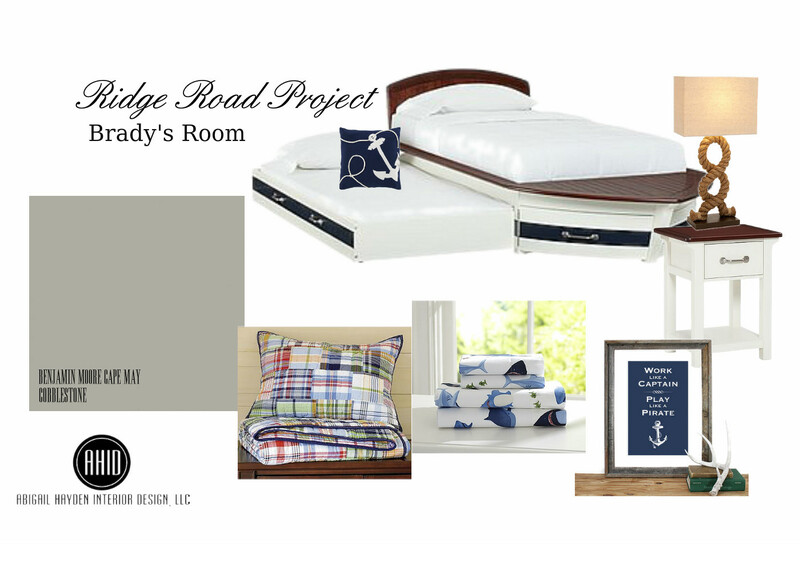 I have tons of projects in the works for clients this spring and thought I would give a brief update! It seems like I have been designing lots of kids spaces lately. My main client base is young families and parents seem to concentrate on the kids rooms before their own….I am guilty of this as well! I do love a kids space and the creative doors it opens. 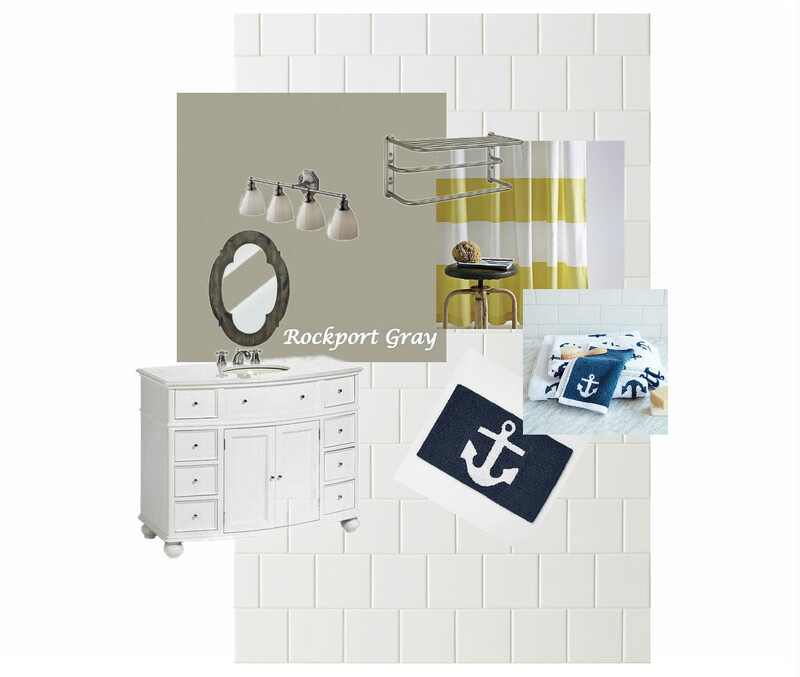 The Mood Board above is a bathroom I am working on for an E-Client. 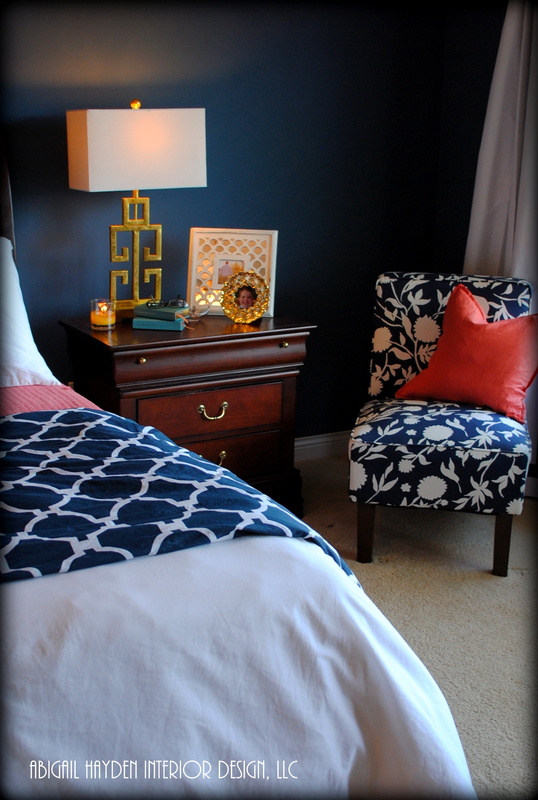 My client has great taste and an eye for style but has been a little stuck on this space. 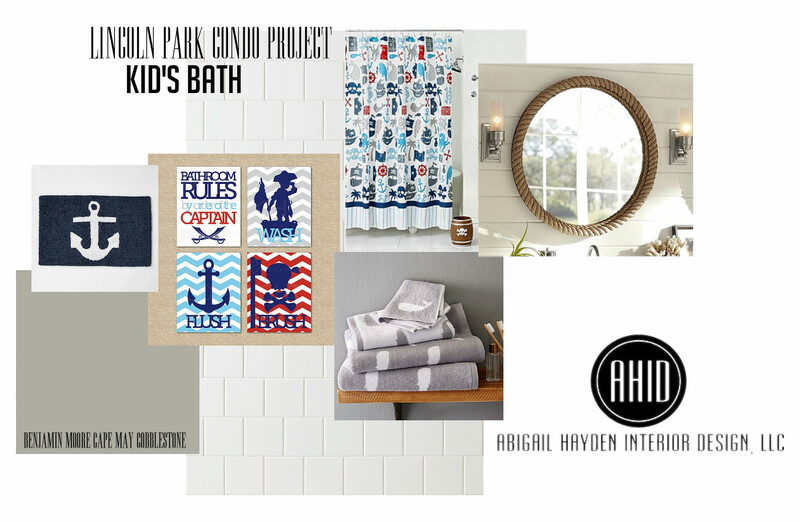 I have to say I cant blame her….there is not a ton out there in the way of shower curtains for boys that are not super cheesy…..where is all the cute decor for kids? Finally The Wall Lake Cottage is done!! 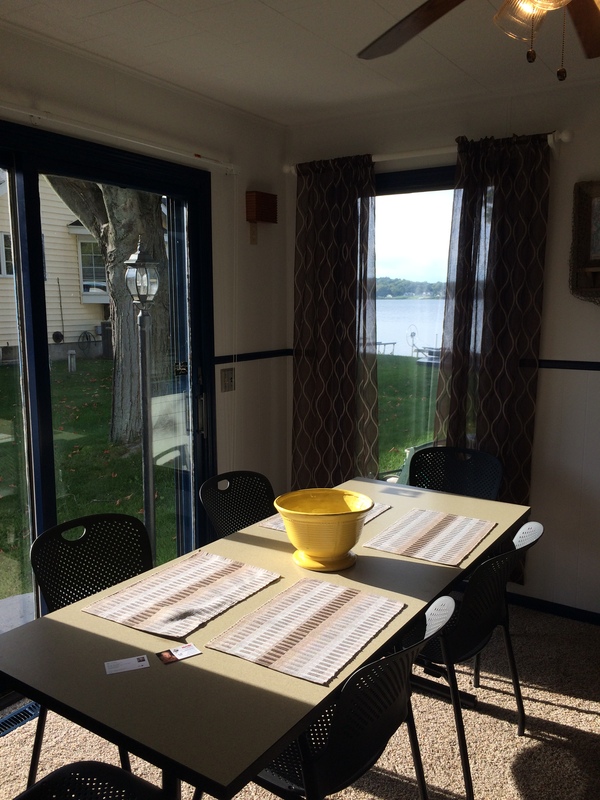 The Wall Lake Cottage is done and open for summer fun for my clients! I have learned so much on this project. The main thing I learned is respect for anyone who is a General Contractor….not that I did not have respect before but, now I know what they go through. When we began this project in the fall, we were naive enough to think we didn’t need one. As the months wore on, we learned a few lessons and the project grew a bit in scope. Its funny because I spent months on construction and just a few short weeks filling it to make it pretty. From now on….I want to stick to the pretty!! So back in the fall when we began, this is what this place looked like…. 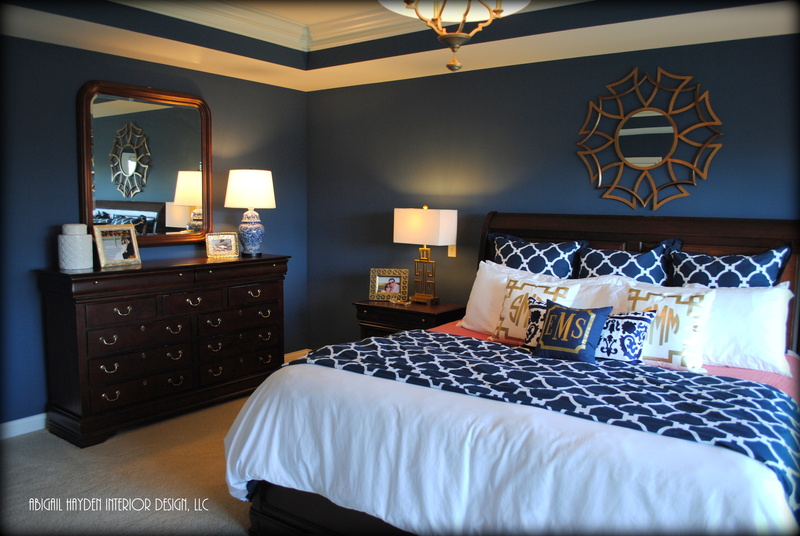 The previous owners looooooved Navy Blue! 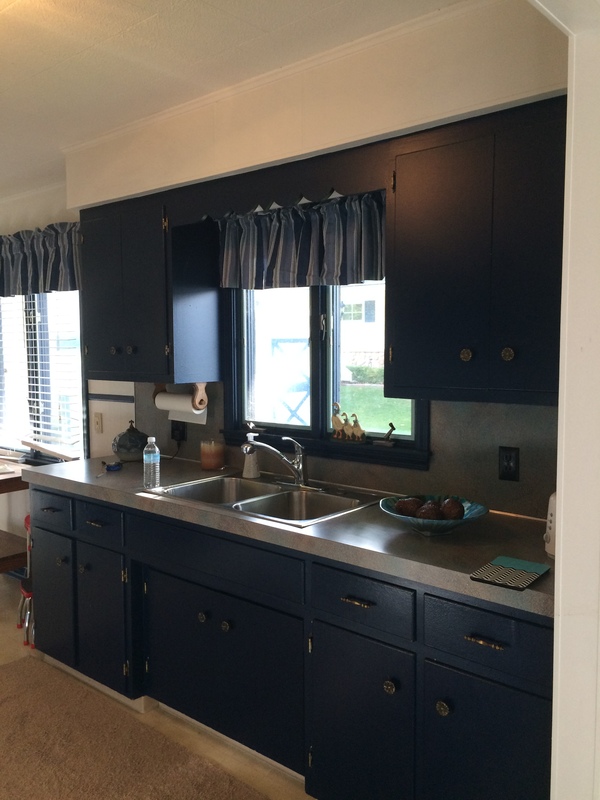 The trim and cabinets were all navy….yikes!! I like Navy too but this was not done correctly as you can see. The first thing we did was decide on a color scheme. 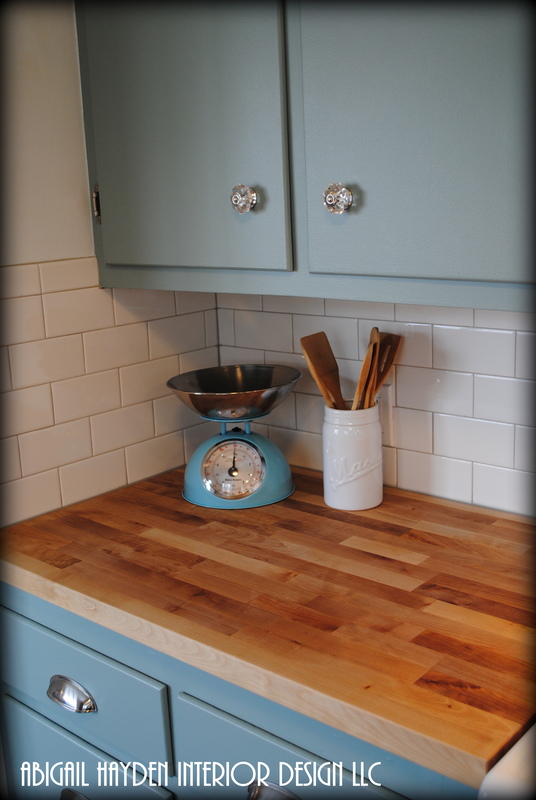 My client and I chose a soft blue green called Stratton Blue by Benjamin Moore for the cabinets and the rest fell into place. Below are the initial concept boards I came up with. 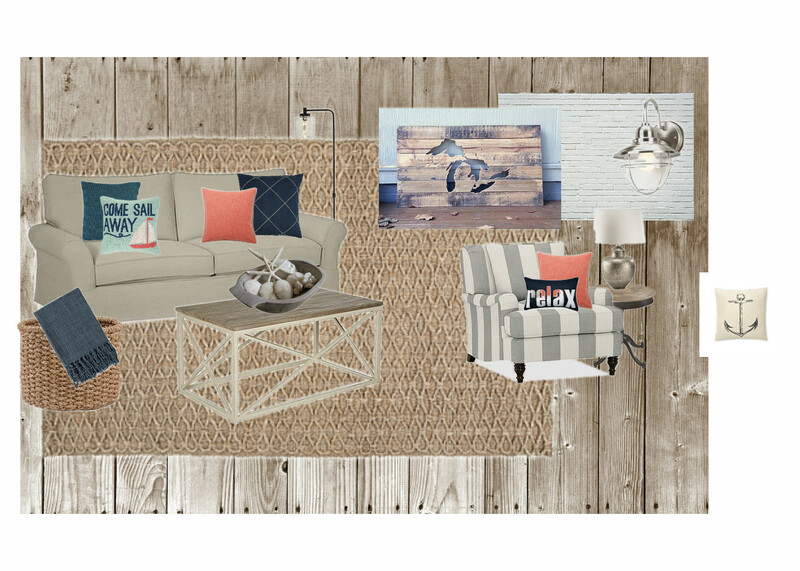 We decided to accent with Coral because it compliments the blue perfectly and add in warm grays as our neutral because that is the color of driftwood. 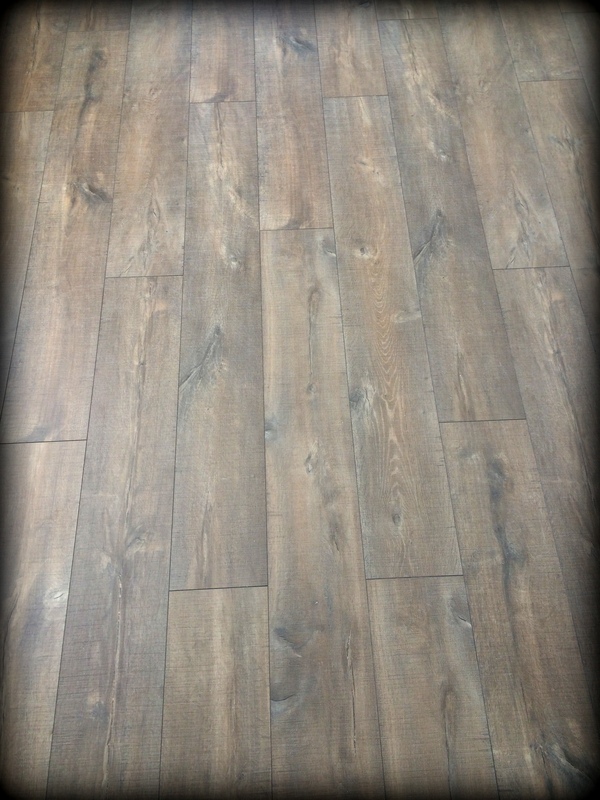 We chose a laminate floor to lay throughout the entire 1200 sq. 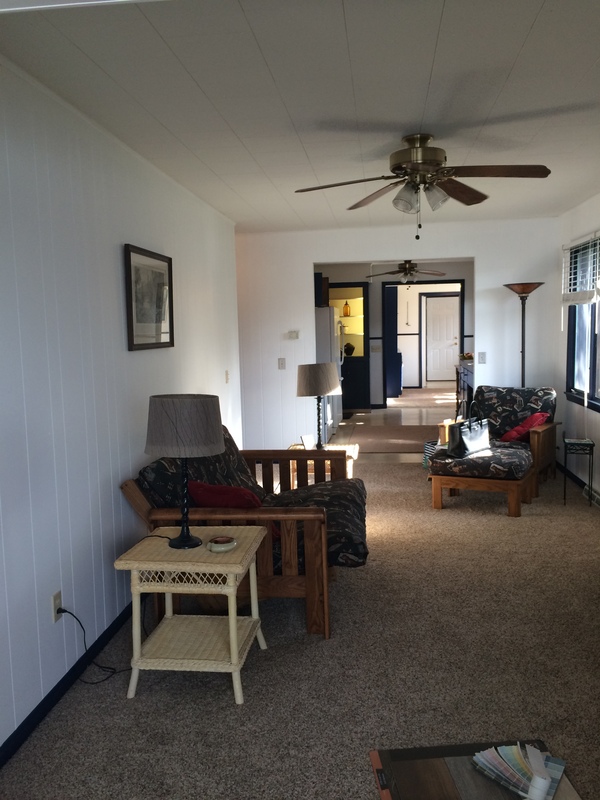 foot house (except the bathroom) to make the space seem larger….plus it is easy care for a lake cottage. We painted the entire cottage, besides the cabinets and bathroom, white. It is crisp and clean….and really opens the space! So, are you ready to see the end result? 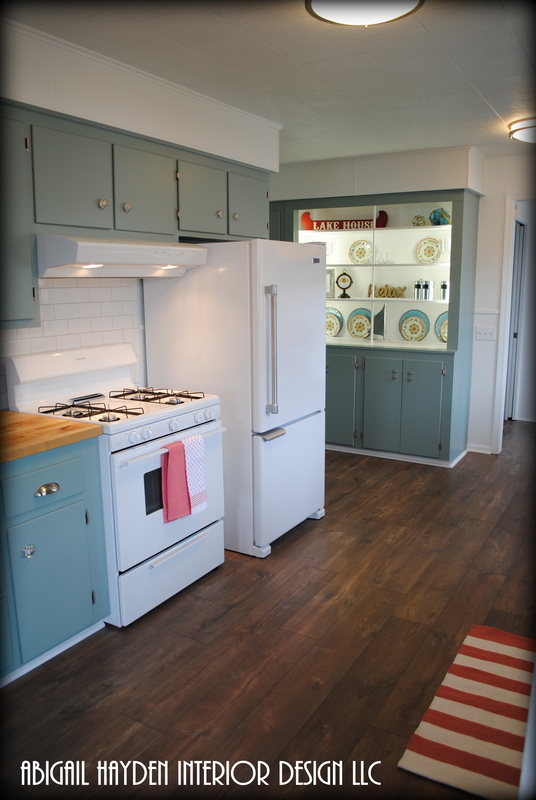 Lets start with the Kitchen because this room is in the center of the house and contains the color we began with. We kept the 1950’s solid wood cabinets. We also kept the stove but got a new range hood and refrigerator. I did have to shop a bit for the fridge to make sure it fit under the cabinets and when I found this Maytag, I knew we had to have it with the stainless handle. It has an updated vintage vibe. I bought the wood butcher block from Menards and had my carpenter cut it on site and install it. 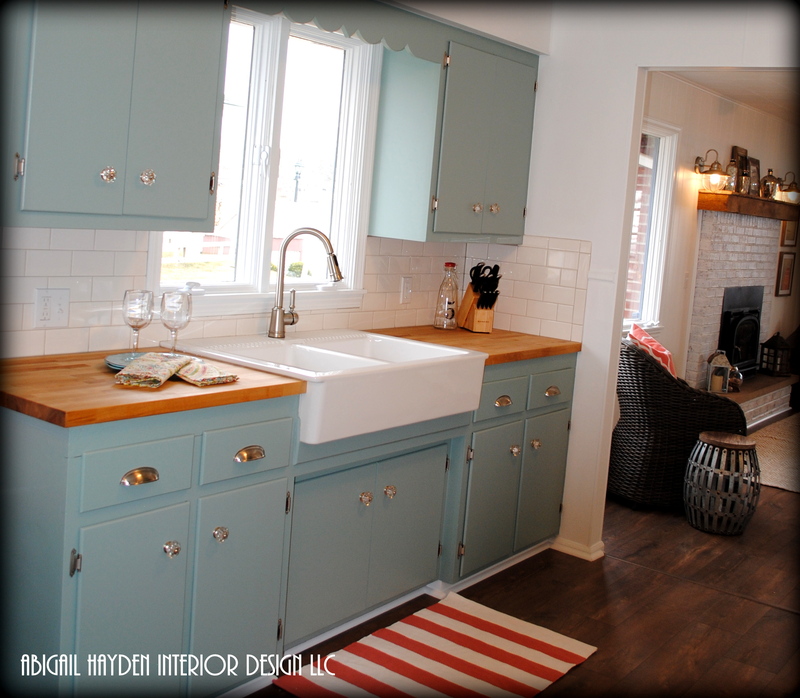 The sink is from Ikea and the faucet is by Moen. 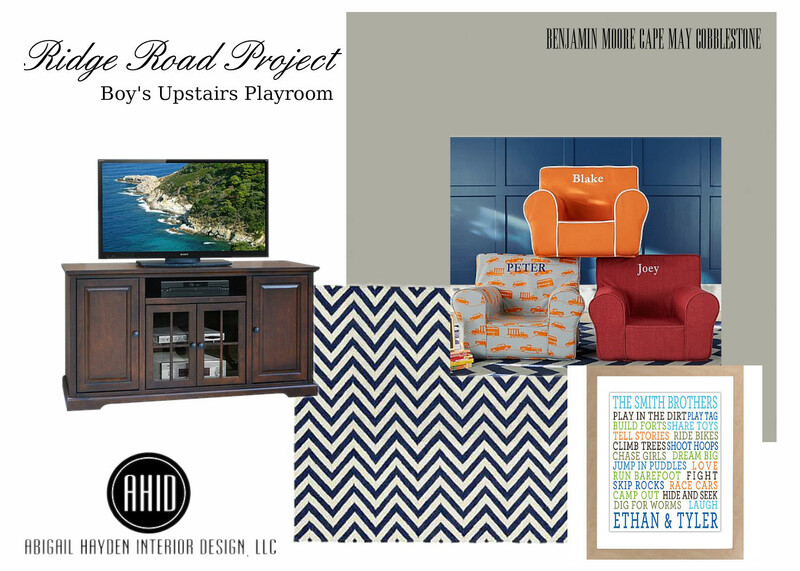 That cutie coral striped rug is by Dash and Albert, which is a must have for any lake cottage. The light fixtures are round flush mounts that mimic nautical lighting but not in the cheesy sense….I just bought these from Home Depot. 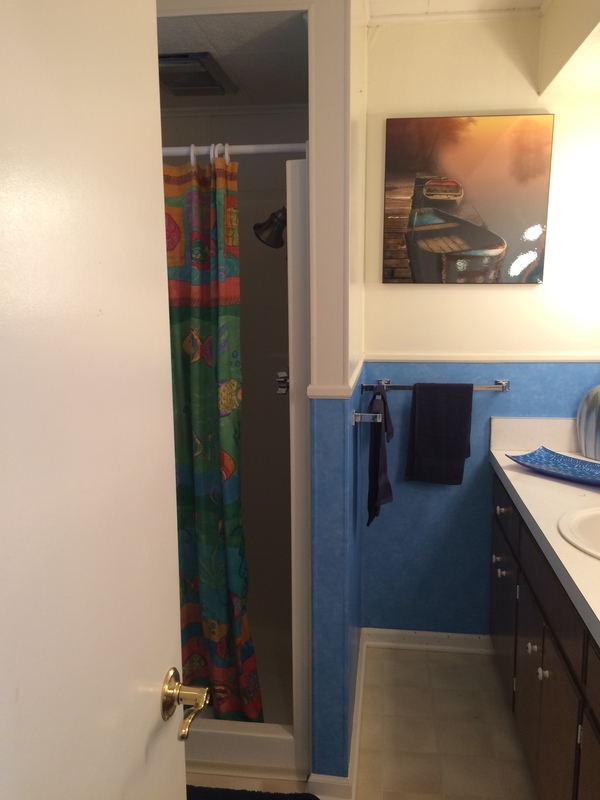 We have low ceilings and wanted to keep them tight to the ceiling to make the space seem more open…..especially since this is the center of the home. The knobs are all mixed, as all kitchen should have! There is nothing I hate more that a kitchen with 52 of the same knobs!! 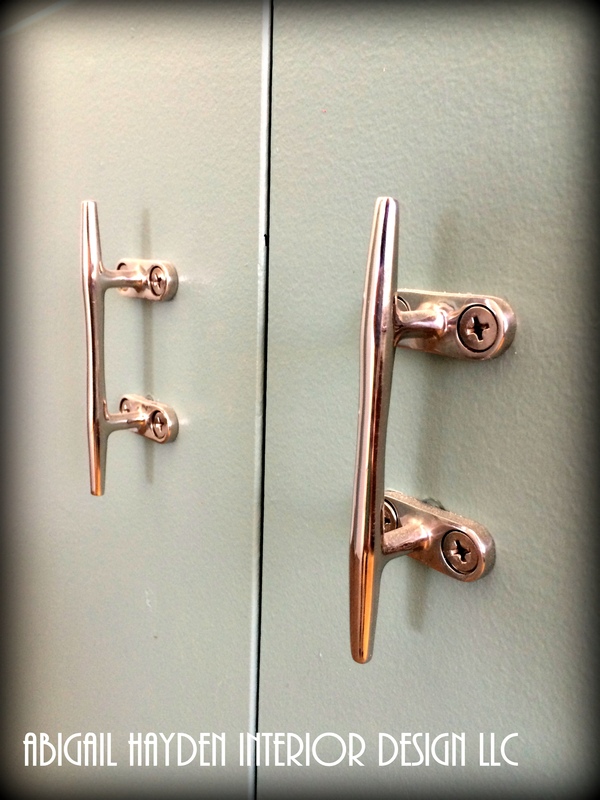 The drawers are nickel cup hooks, the doors in the kitchen are glass knobs for the vintage appeal and the doors on both built in units have stainless ship cleats purchased from a marine supply company. Mixing up your hardware just add to the character of the space. So whats next? Lets reveal that living room….. It made a pretty cute transformation! We had a white blank canvas to work with. I ordered this slip-covered sleeper sofa from Pottery Barn in Textured Linen for a comfortable relaxed look. The rug is a chenille and jute from one of my rug lines that is super soft on the toes. The tables and pillows also came from a few scattered lines I carry at AHID. The reclaimed map of the Great Lake was done by a local artist in Kalamazoo. My client was the one who found him….and this is my favorite thing in the room!! I just ordered one for myself too! What a talent! The sconces were replaced with new nickel outdoor lighting from Home Depot. 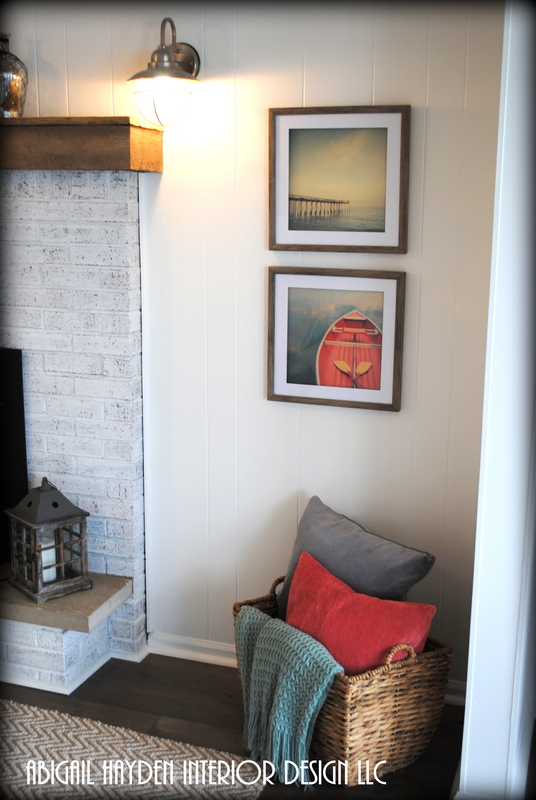 I love these sconces and why not use exterior wall lights inside a lake house? The fireplace and mantle made the biggest creative transformations. 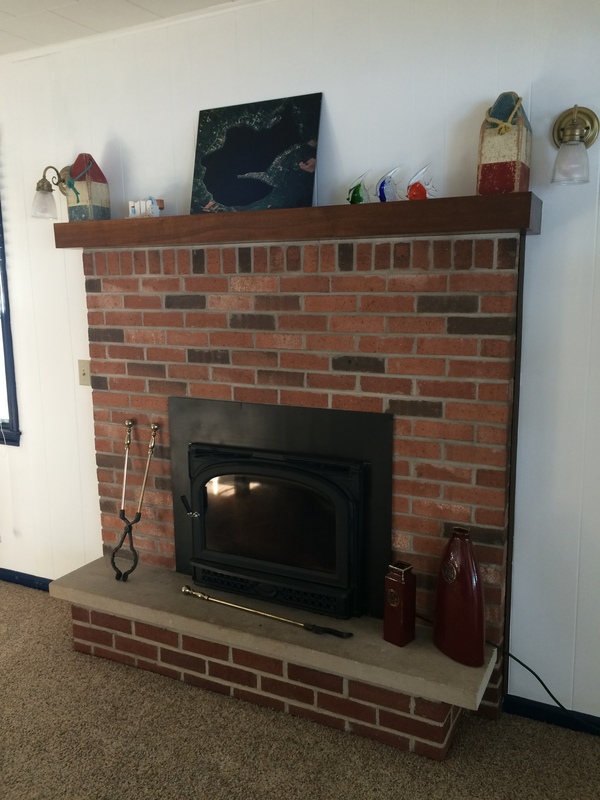 The old fireplace was two different kinds of brick that by no means matched. We had to paint it or cover it. I chose to paint it and keep the budget down. I tried to explain to the painter what I wanted and she wasnt getting it, so to keep this project on track, I just dove in and painted it myself! I got on Pinterest, found the look I wanted and followed a bloggers tutorial. I wish I remembered who because I would totally give her credit! It turned out great! It was just white-washing with the right amount of wall paint (which we already had) mixed with water and a rag technique. 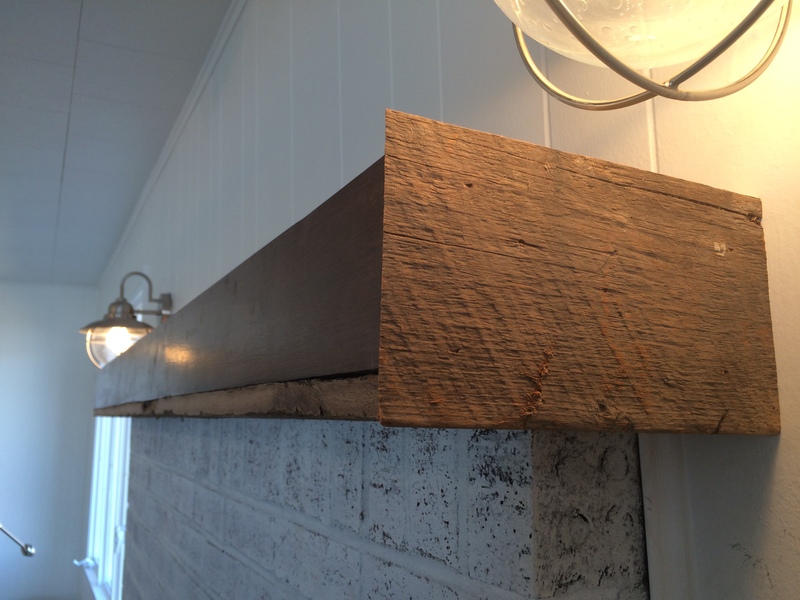 The mantle was just a solid piece of wood….kind of non-descriptive. My decorative painter was at the cottage one day dropping off a table and suggested I put barn wood up there. 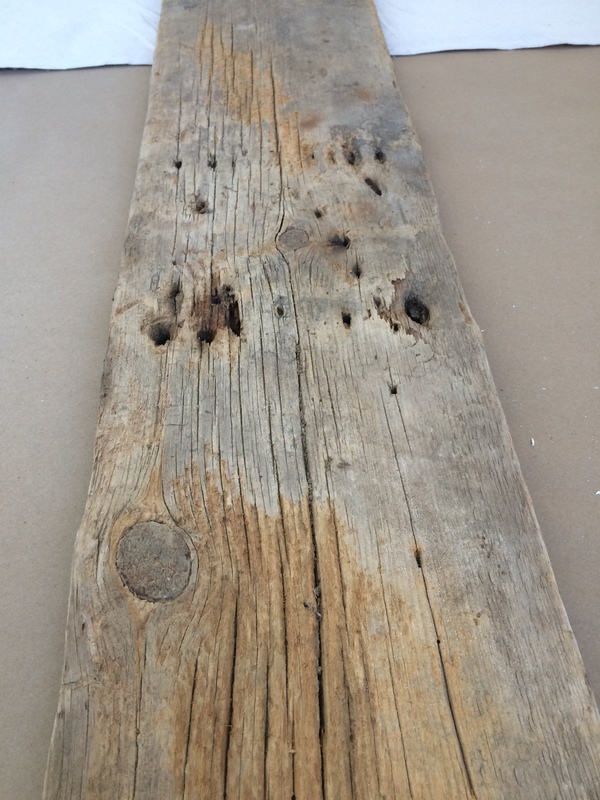 Months later, we bought a few 100 year old barn boards and my carpenter showed us how talented he is. 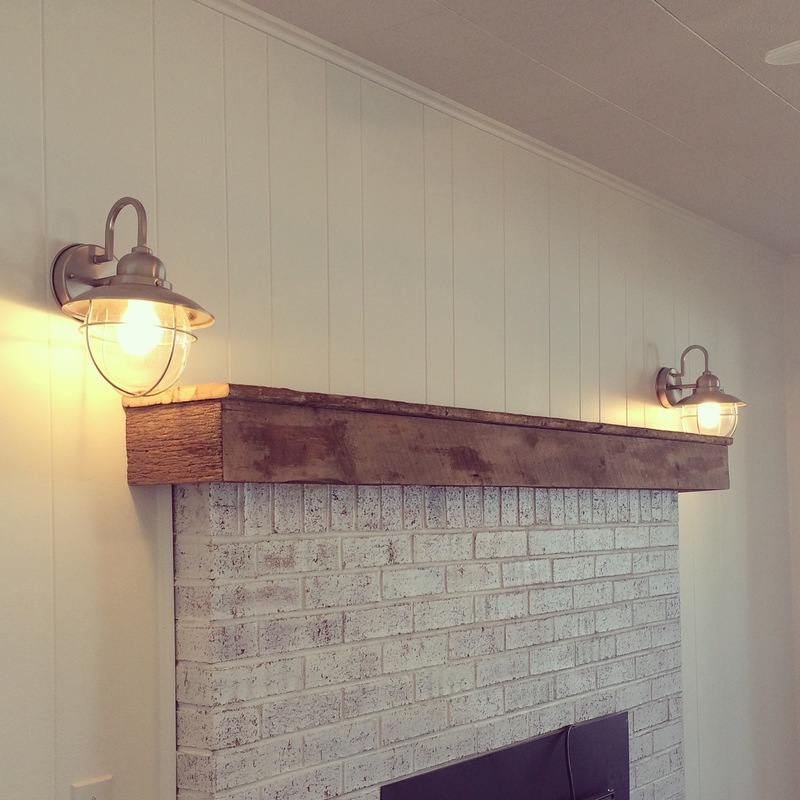 He skinned the old mantle and it turned out beautiful….like it was here all along! Right off the Living Room is this cute little porch addition. The windows face the lake and this small space leads you right to the water. I guarantee that this is going to be my clients favorite spot in the house. We decided to put another sleeper sofa in here for overflow guests as well. This little 1200 sq. feet can sleep 10 if you can believe it!! This sleeper sofa is also from Pottery Barn and slip-covered in Texture Twill Metal Gray. The ottoman actually belongs with a PB chair we are still waiting for. Both are covered in Pottery Barns new Performance Awning Stripe, which is actually an indoor outdoor fabric. 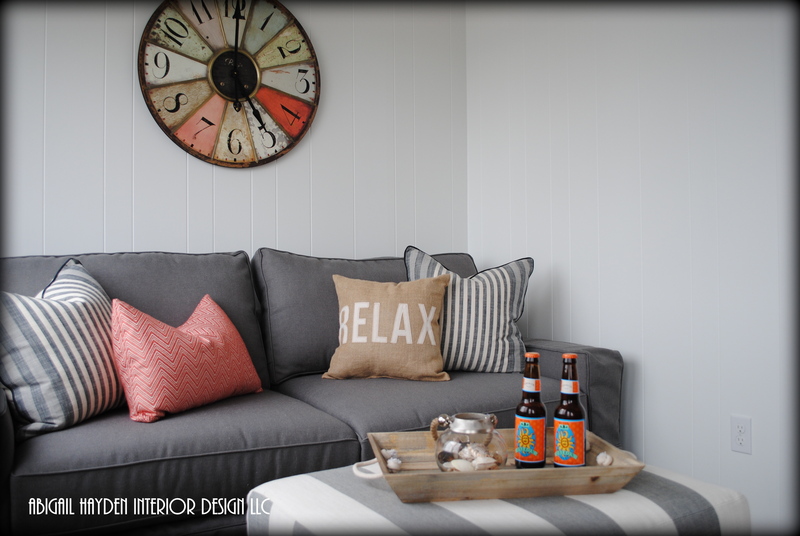 Dont you want to curl up on this sofa with a beer and relax? I also added a sideboard with board game storage on the opposite wall. The sideboard and all weather wicker arm chair are from World Market. 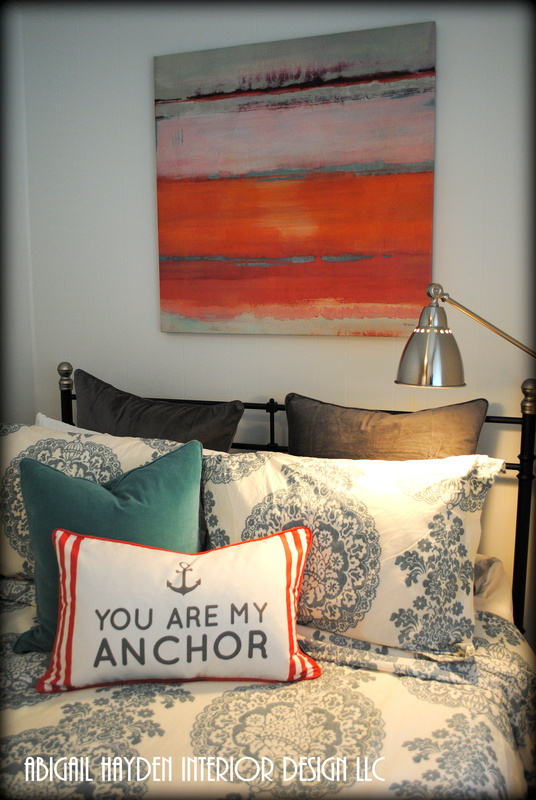 A couple more pops of coral in the lamps and accessories to tie all the rooms together. 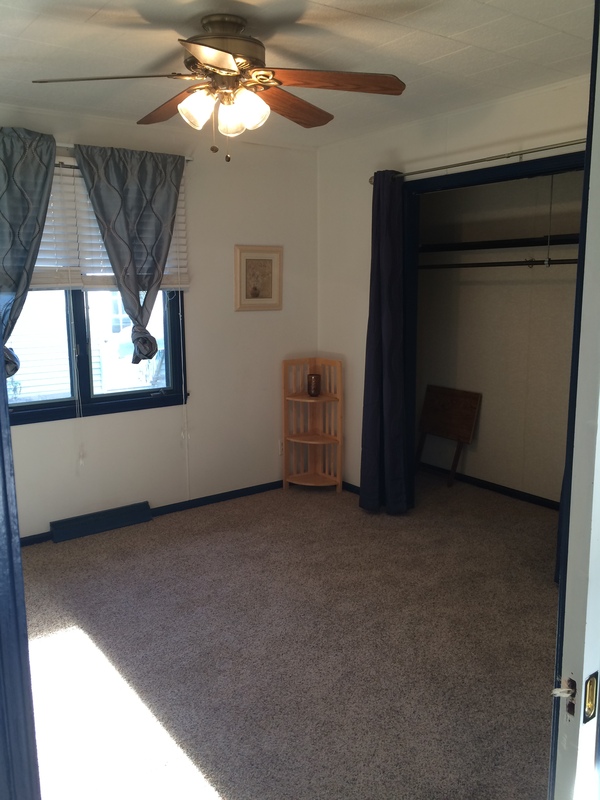 Off the living room is a tiny hallway that leads to the master bedroom and only bathroom. Look at this hot mess…. 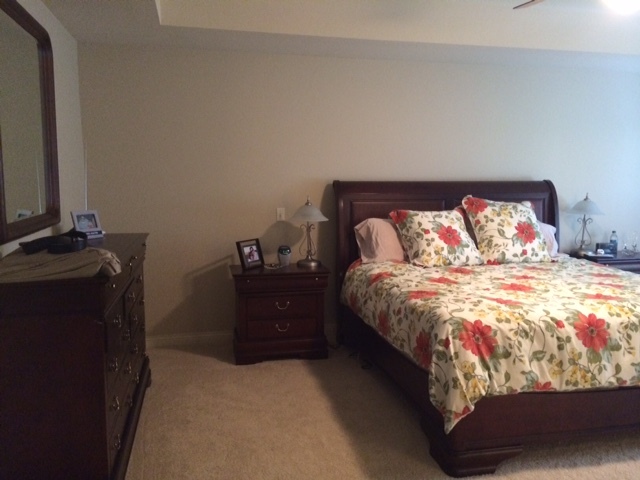 I just found the before photo of the bedroom and need to share it! It is a tiny bedroom, but we kept it simple. I kept the same color scheme in here as the living room, kitchen and sun porch. 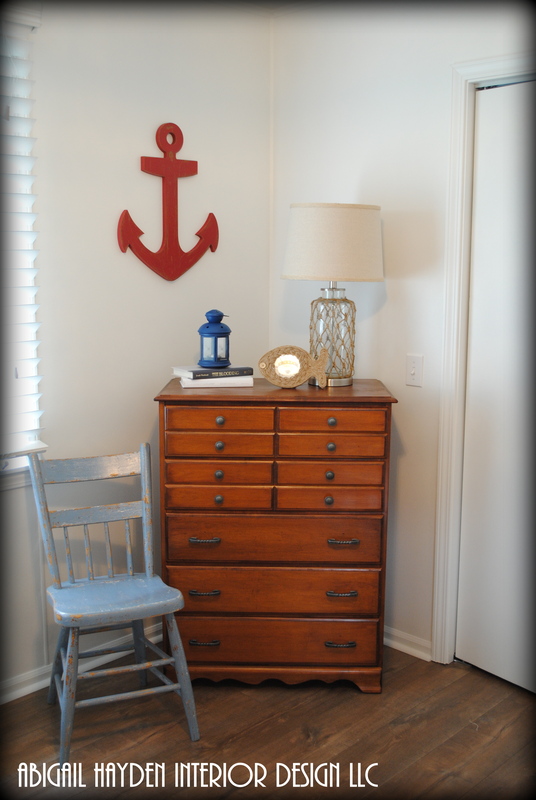 Just pops of coral but I went a bit further with the dresser and artwork to add some fun. The Client needed to have a queen bed in here for comfort sake, so we were very limited on space. 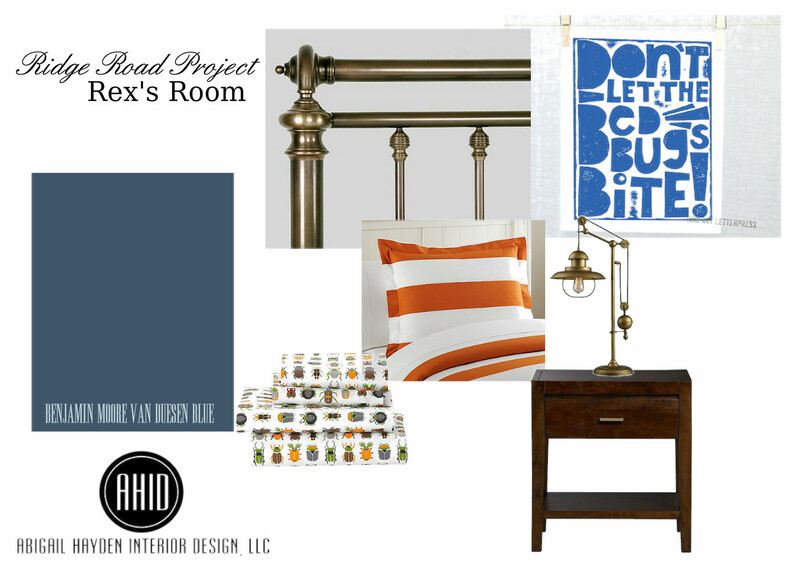 The bed is from Ikea and so is the floor lamp. The bedding is Pottery Barn. 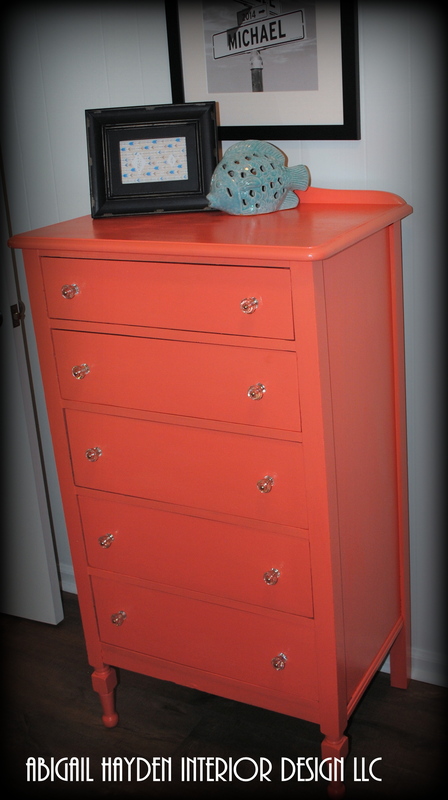 My decorative painter found me this cute antique dresser and painted it coral….she thought I was nuts when called her and told her the color, but loved it all when she came to deliver it. I am so glad I took a chance and went with my gut. 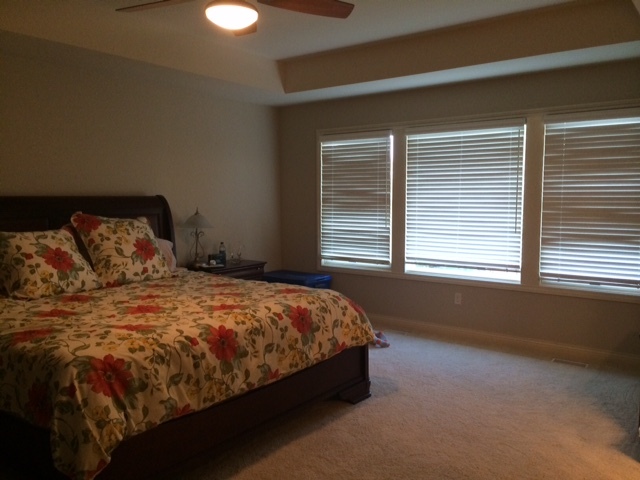 I think this room made quite a transformation, don’t you? Across the hall is the only bathroom in the cottage. This room was in terrible shape and had to be gutted. Lets look at the before again…..it actually looks better in pictures then it did in person! We put up new drywall and replaced the 3 foot shower stall with a 6 foot tub. 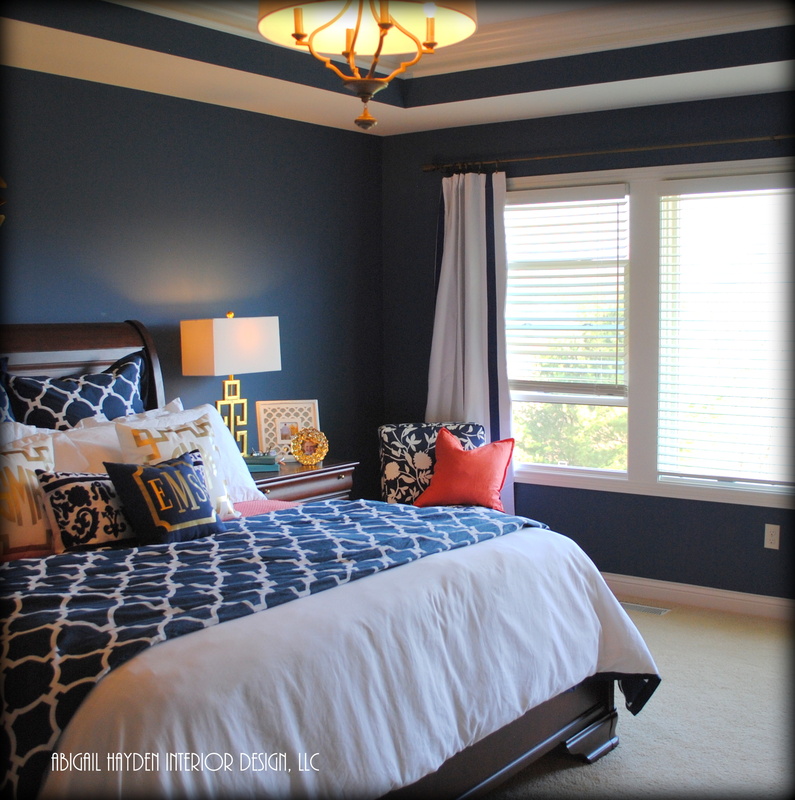 I kept the decor very simple and just painted the walls Rockport Gray from Benjamin Moore. The shower curtain is a basic white. We had extra space left over in the corner after the shower was installed. My carpenter built me floor to ceiling shelves and skinned them with white laminate for easy cleaning. 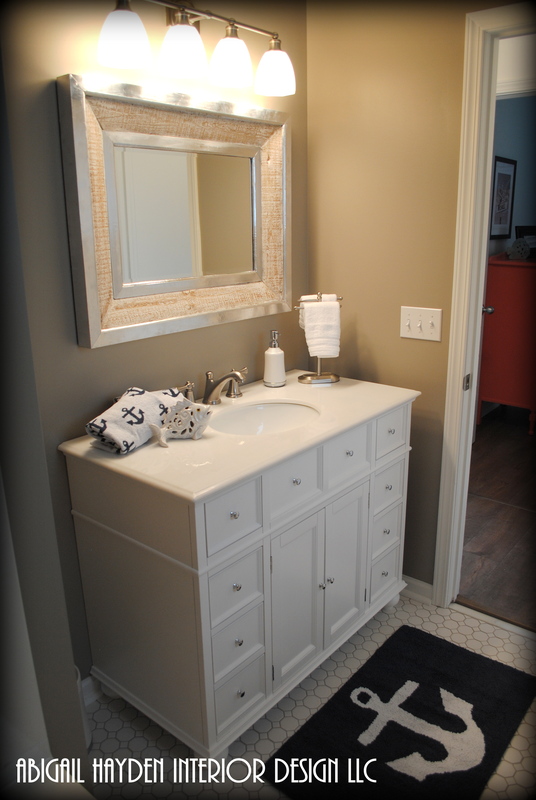 The vanity is from Home Depot. 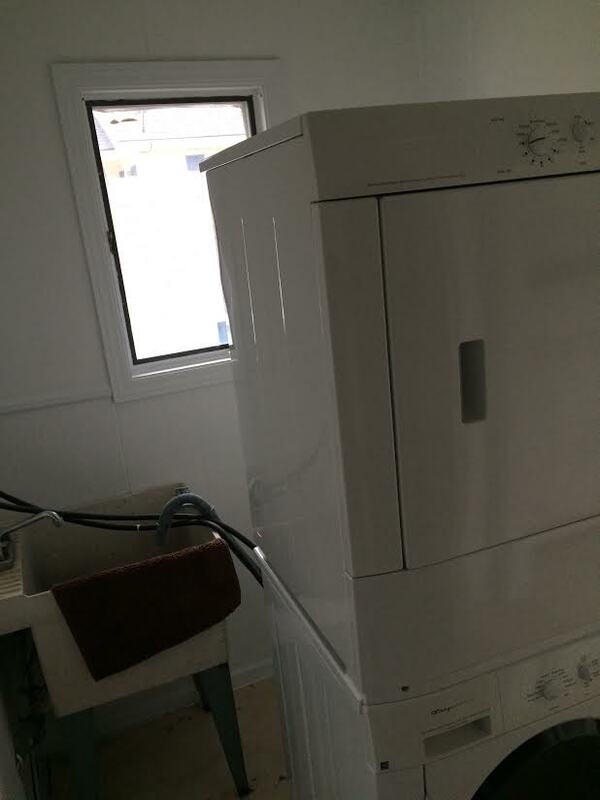 It is all white with a white marble top to add a bit of luxury at the lake. The light fixture is Murray Feiss and the faucets are all American Standard. 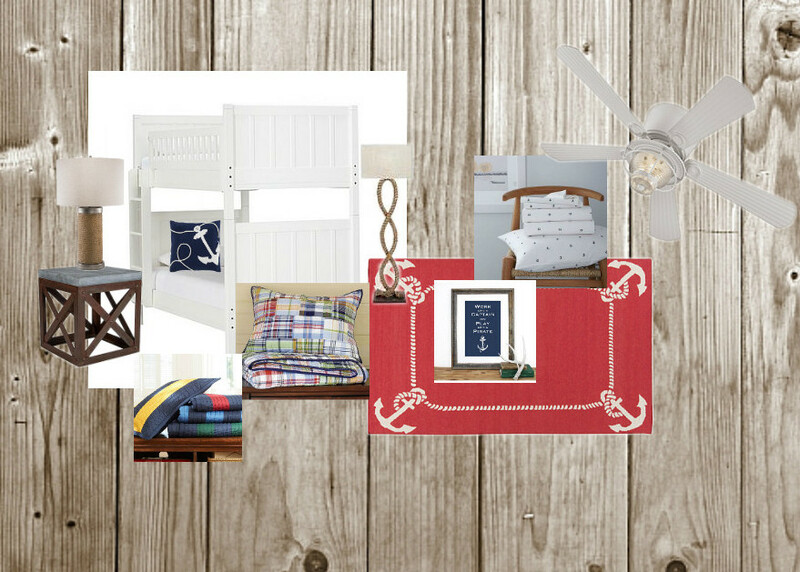 The anchor towels and rug are all from West Elm. 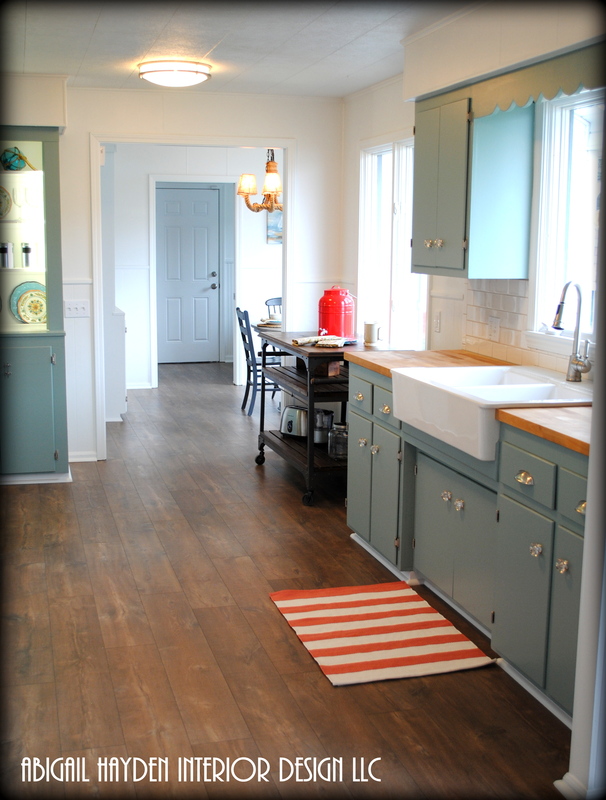 I kept the flooring very simple with standard white hexagonal tile sheets from Home Depot. 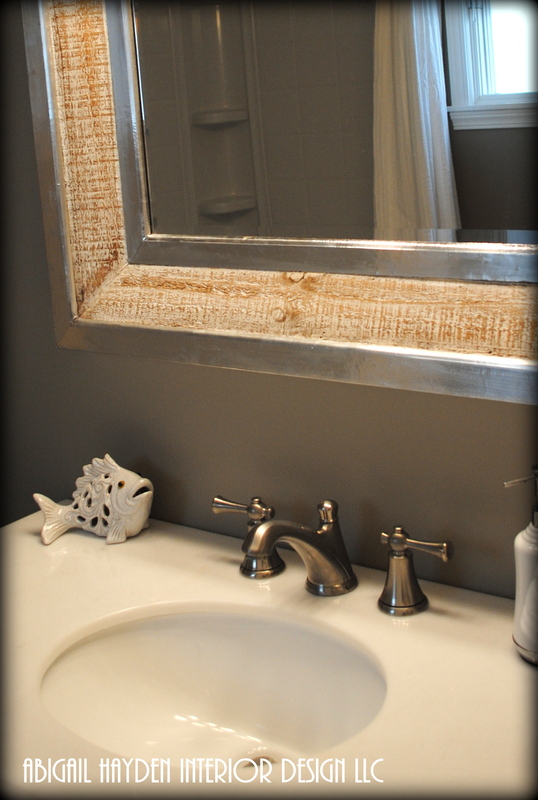 I used a darker grout to match the warm gray in the driftwood flooring throughout the house. 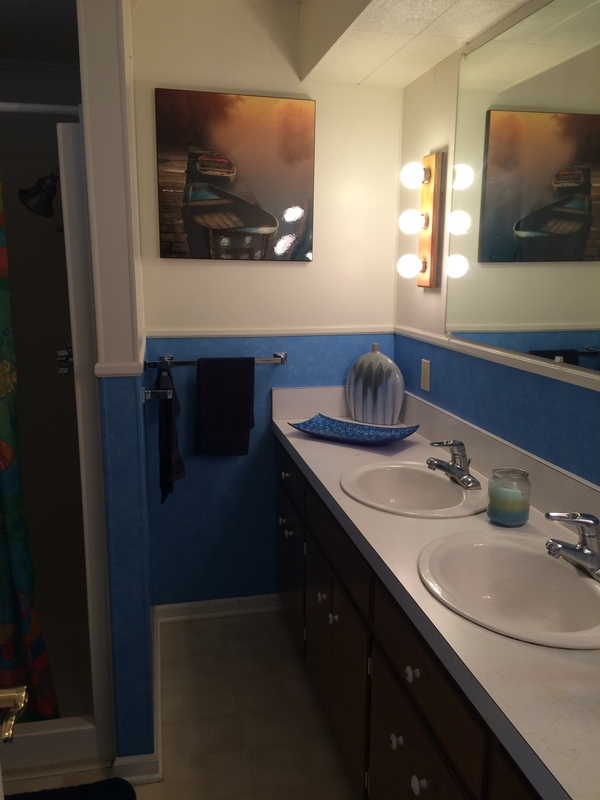 I did this for two reasons…I hate white grout (who wants to keep that clean?) and I wanted the tile pattern to stand out and add interest to this tiny bathroom. On the other side of the house, just beyond the kitchen, are a few other rooms. Lets start with the small dining area. Its so hard to imagine that a few months ago, this is what it looked like….seriously only in my nightmares! We started with a white blank canvas again. 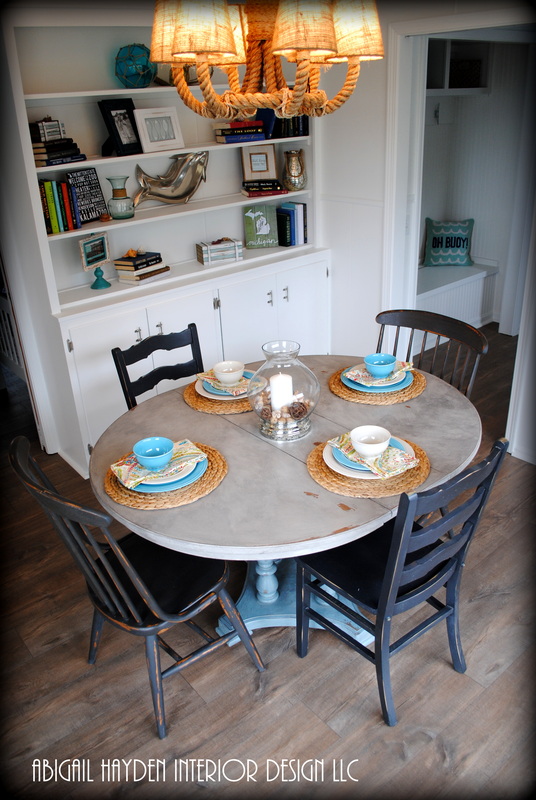 Then, I found this cute table and chairs from my super talented decorative painter, Becky at Urban Revival. The chandelier is from Pottery Barn. 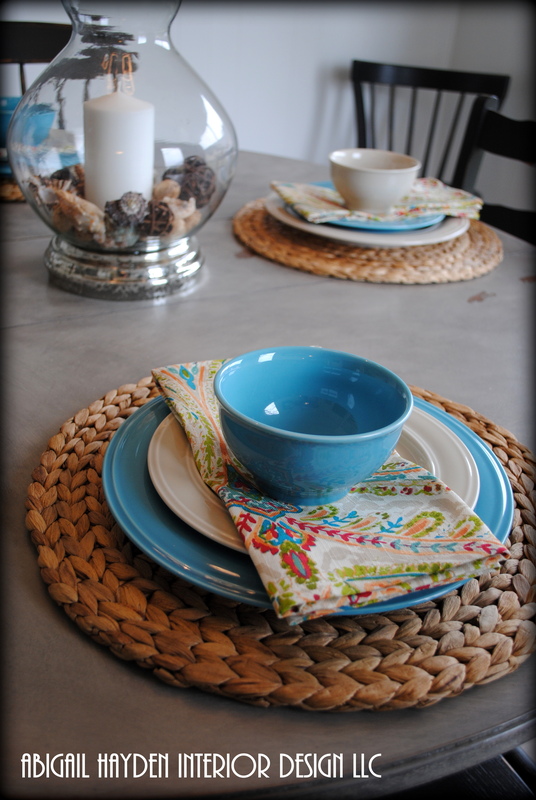 The table accessories are World Market. The rug is still on order and is just a simple braided jute. Off the dining room is the clients boys Bunk Room. Above is what it looked like before. Man, did these people love an oak ceiling fan too! 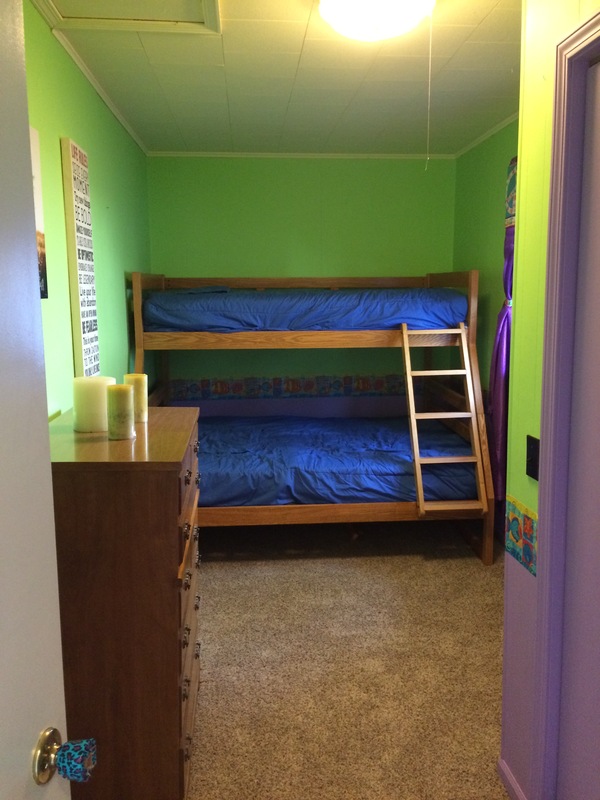 The room has two sets of bunks decorated in more primary red and blues. The sheets and bedding are Tommy Hilfiger. 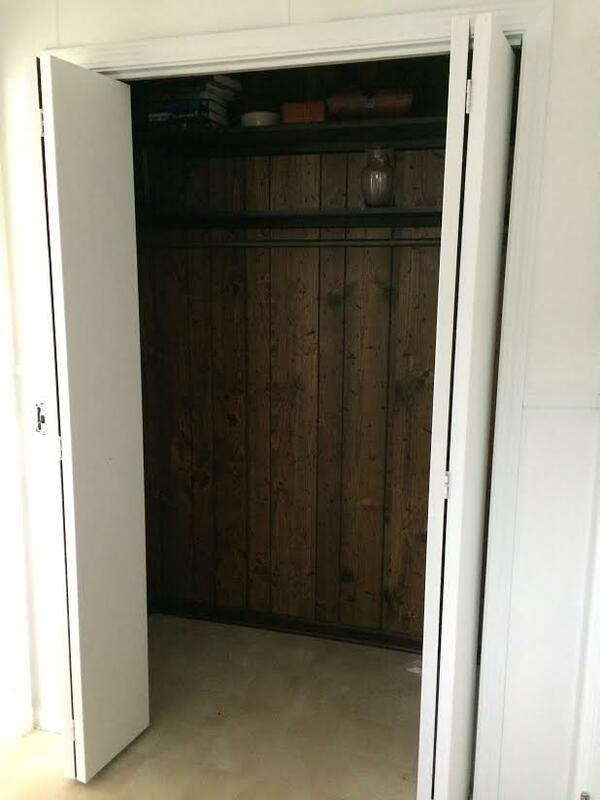 This room got closet doors, which were in the attic? and we carried the driftwood flooring in here as well. 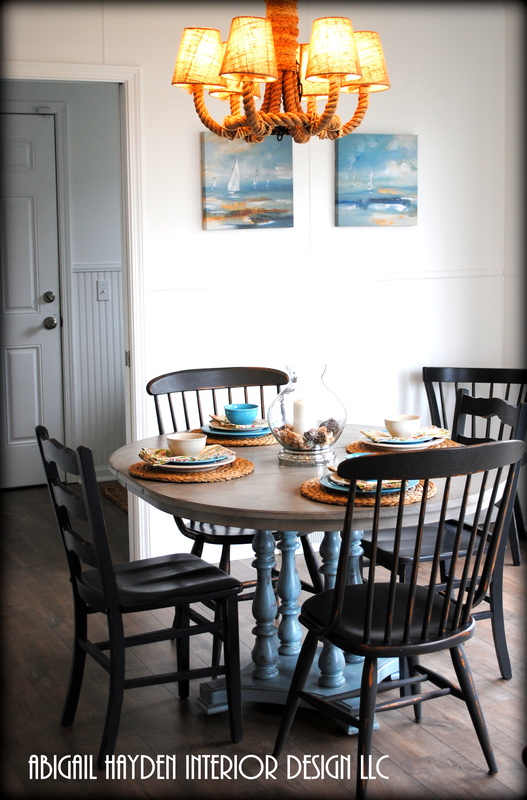 Becky painted these cute side chairs as well….this room is so close to the dining area, that I made sure there were extra scattered for visitors. If we can sleep 10, then we need to seat 10 to eat, inside and out! The last room has made the biggest transformation. 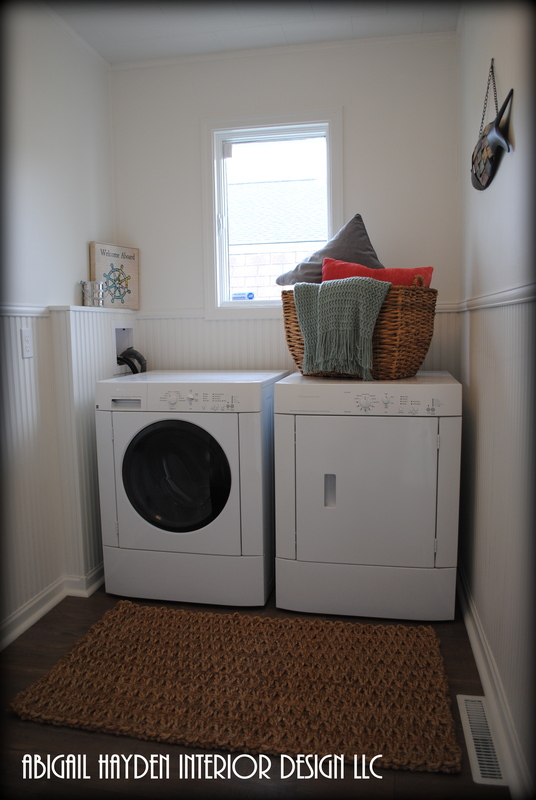 This is the laundry room, and also how you enter the house from the garage. Check out that before…. 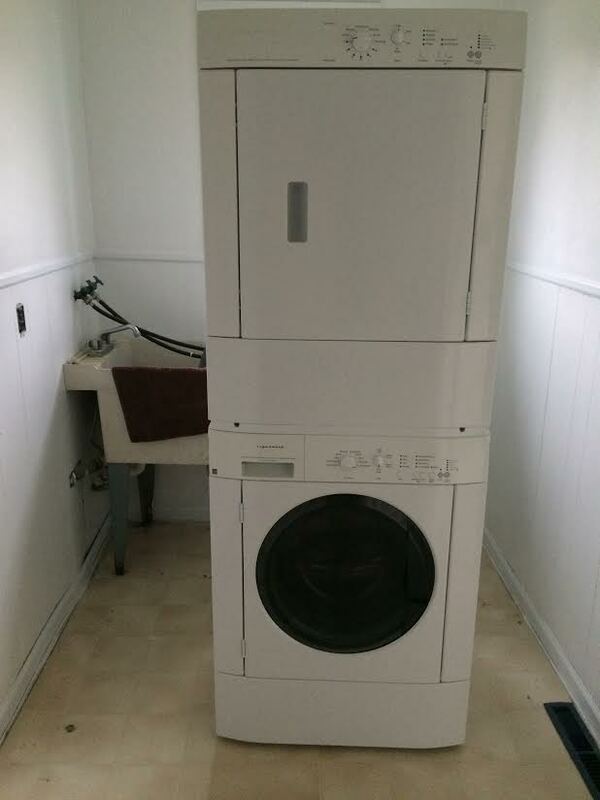 Yes….that is a stack-able washer and dryer in the middle of the floor. Yes, they are draining into that hideous sink. What are people thinking???? We ditched the sink and my awesome carpenter from CE Squared Construction came up with a solution. What do you think of this???? 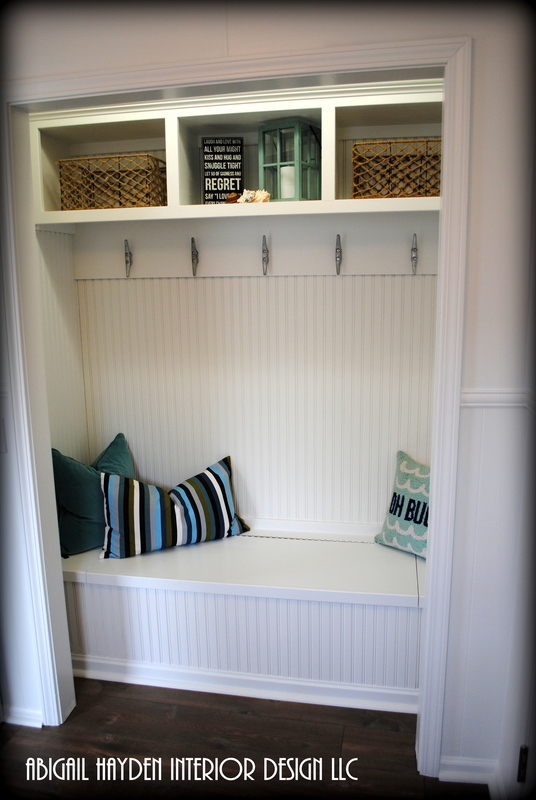 While he was solving my laundry problems, he also made this useless coat closet into a mudroom directly across the room!!! So talented!! I love how this turned out. 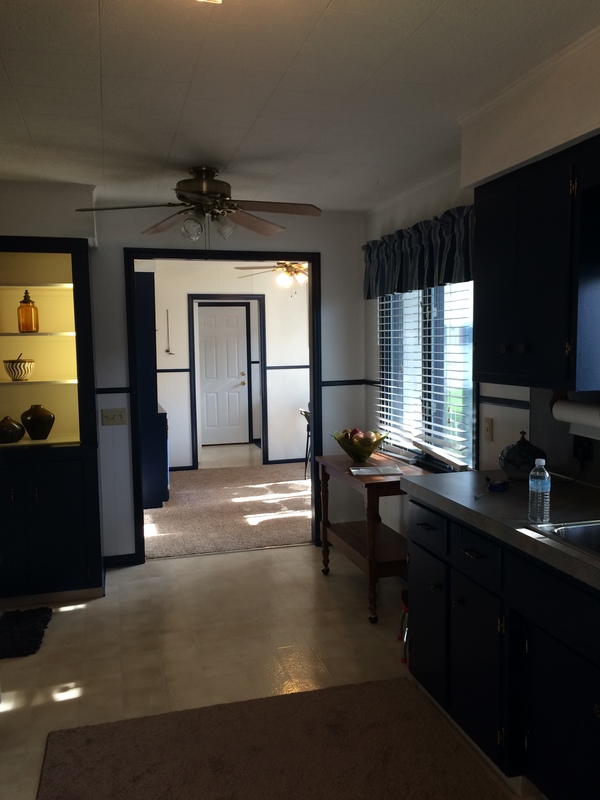 Check out the Before compared to the After…. The seat opens up for storage and the coat hooks are boat cleats straight from the local marina. I think these clients are officially ready for summer in Michigan!! Thanks for visiting my latest project. Leave me a comment and let me know what you think! An Entire Floor for Little Boys!!! Today I worked on the preliminary design for the second floor of an upcoming project. I can not tell you how excited I am to be part of this remodel! 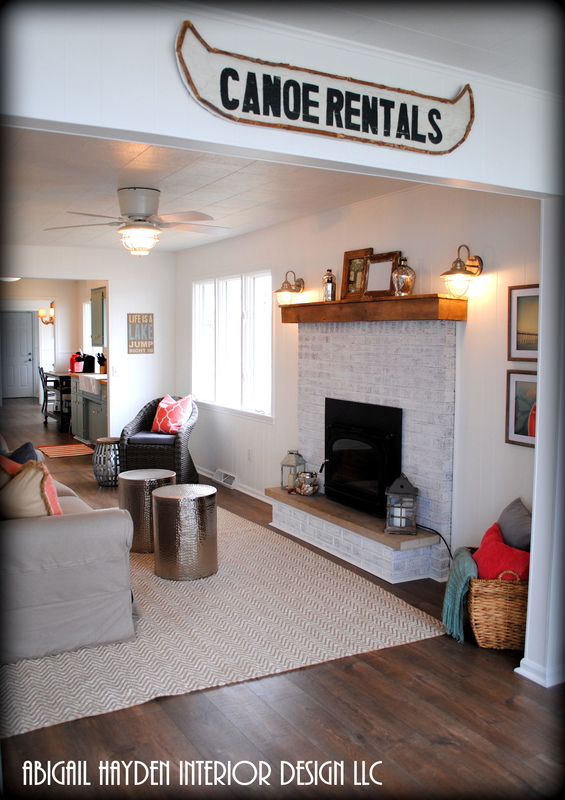 This home is part of Kalamazoo’s history….and its the cutest 1920’s colonial ever!! In the best shape too! The previous owner took great care of this house and now we are going to tweak it a bit for my clients before they move in.Unfortunately, it has to be rewired first due to knob and tube wiring.It’s a total budget killer….and I am not looking forward to the weeks of plaster work that will follow before we can get inside to start the design transformation. The entire second floor of this colonial belongs to two little boys….are they lucky or what? Here is what we have in store for them! First Up….The Play-space they share at the top of the stairs. This is the perfect little space to hang out and play video games or watch TV.I even had a request for a mini-fridge from a four year old!! Too Funny! There is a room off to the left of the playroom that is the ultimate boys room. The previous homeowner sold us his two antique brass twin beds from Europe, which are so fabulous!! 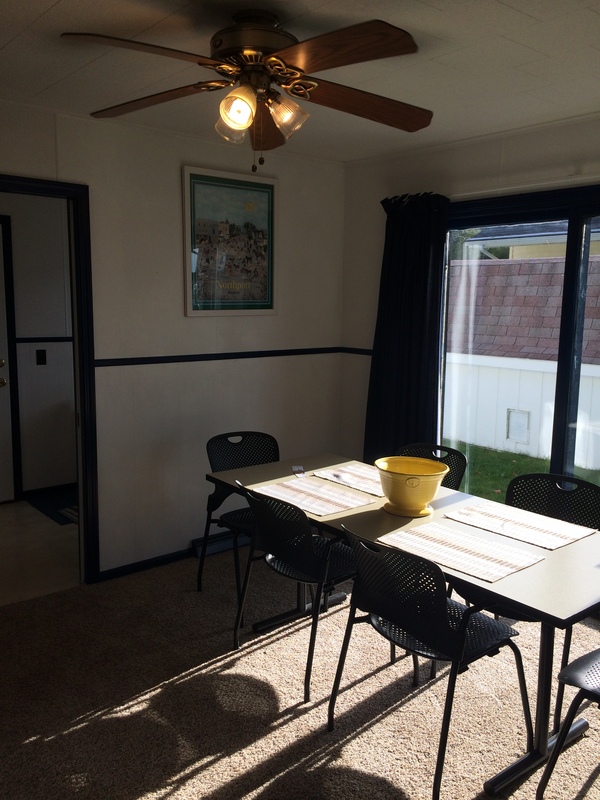 The room has a built in desk area and small sitting porch, which will make a great place to play toys. We went with a fun “Bug Theme” that can be easily changed as this oldest sibling grows up. The other bedroom is a bit smaller for the youngest boy in the family. 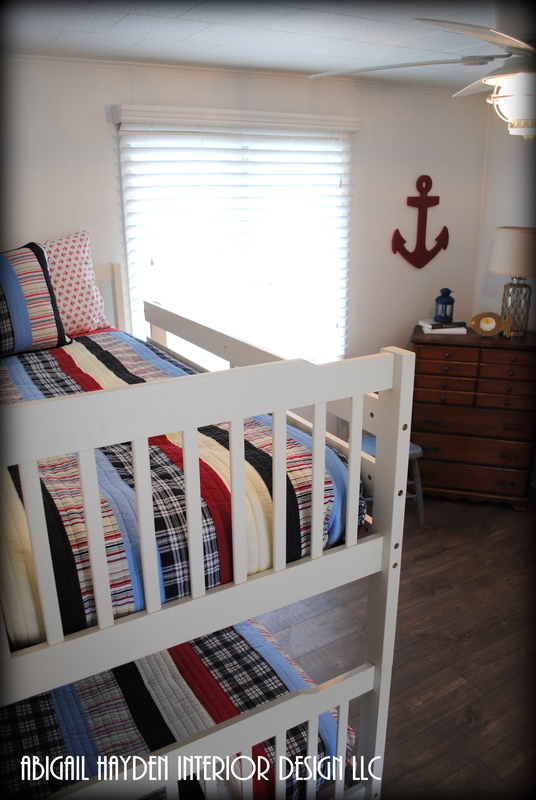 I think his bed is by far the coolest though….lets hope there is no sibling rivalry over the beds!!! Kids spaces are the most fun part of my job for sure! 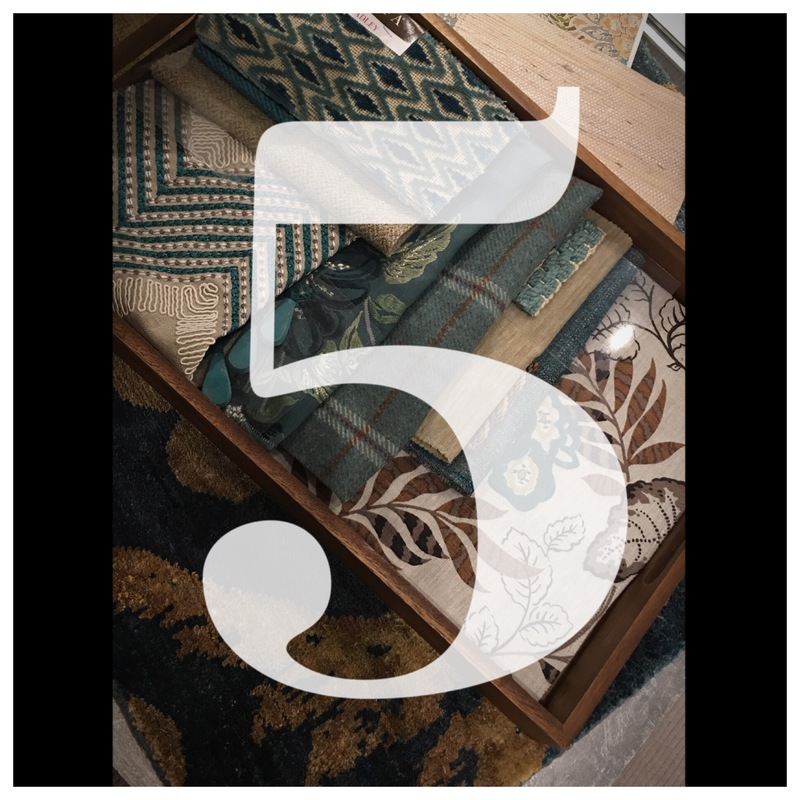 Stay tuned….next is the first floor and master bath! So proud of this little DIY! I met with my “Terrier Trail” Clients today. 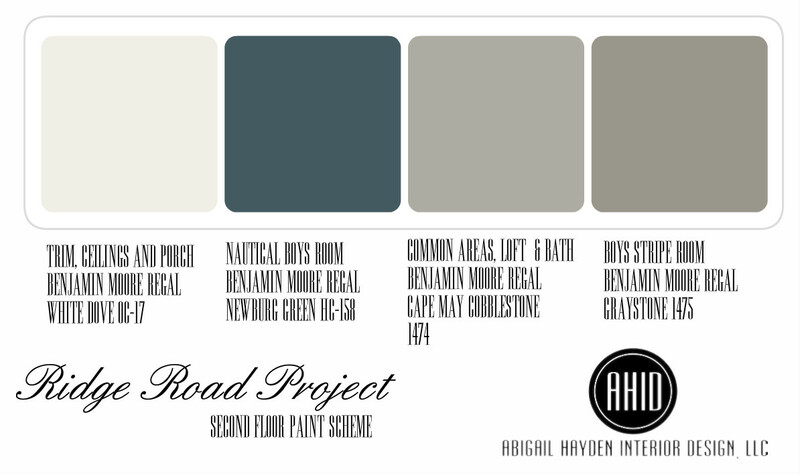 We have been working on a Whole House Color Palette for paint plus some rugs, furniture and accessories coming down the road. We have only been working together for only a few weeks and are in the early stages of design. 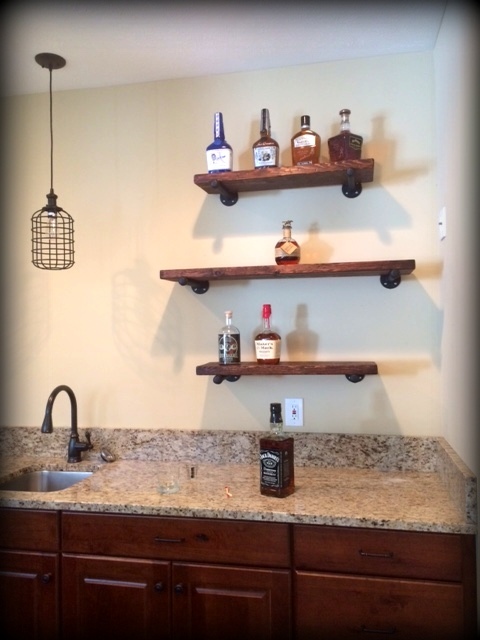 One of the priorities for the couple is to complete The Man Cave/ Whiskey Bar in the basement. When they first moved in they had some cabinets installed to form the bar area but that is as far as they had gotten. 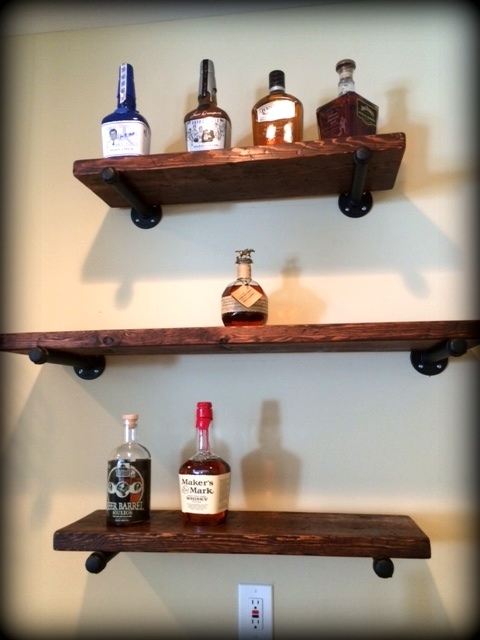 After my initial consult, I went home and looked for ideas to complete the bar shelving. I pinned this idea and it was exactly what they were looking for! Thanks so much 7th House on the Left !!! 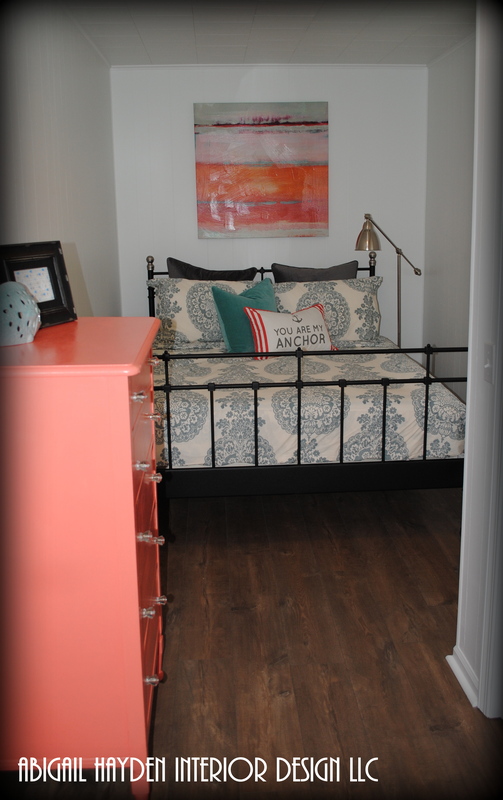 I was in the basement, finalizing the paint scheme when I noticed that they were up and just what I had pictured….I love that this couple tackled the project before I could even blink! It all only cost $125!! 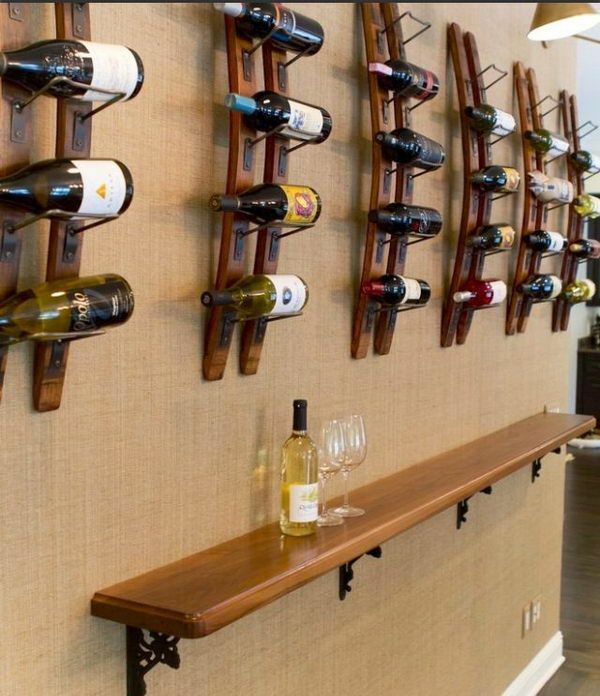 Good thing he saved on the shelving because he has plans to fill them up….and he is obviously using them because Jack is down on the counter with a glass….even better! 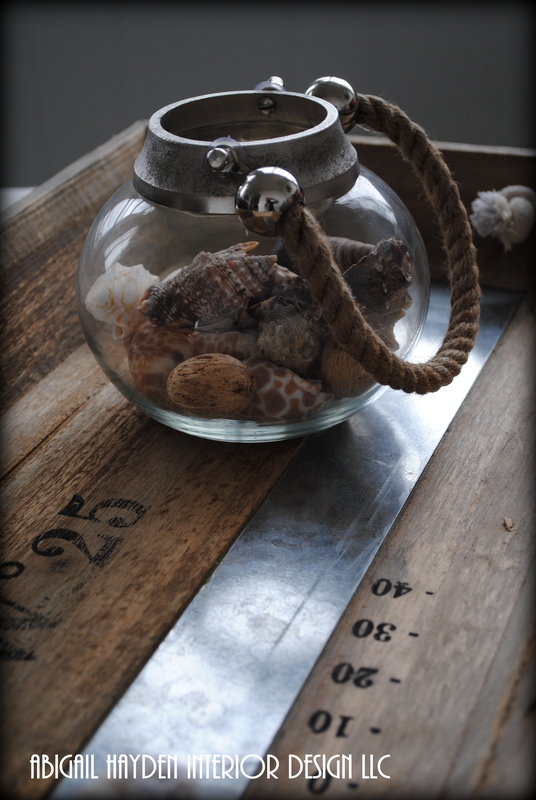 Anyone who knows me, knows that I am a huge DIY’er….and I love it when others take on projects. Large or small, there is so much gratification in building something from scratch. 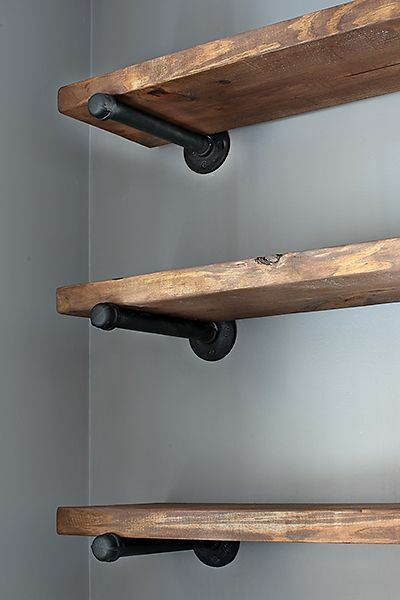 We still need to paint this basement Man Cave/ Whiskey Bar and for the other side of the sink we are thinking a few Wine Barrel Racks like these to also display their wine collection. I just wanted to share a little Pinterest DIY Success!! For all of you out there that Pin and never do it (I am guilty too), tackle a little project this weekend! !